Given its ubiquity in mathematics, it may surprise you to learn that pi is, in fact, wrong. Building on the work of the mathematical heretics who preceded him, Michael Hartl published The Tau Manifesto on Tau Day (6/28), 2010, thereby launching what has become an international movement for mathematical sanity. 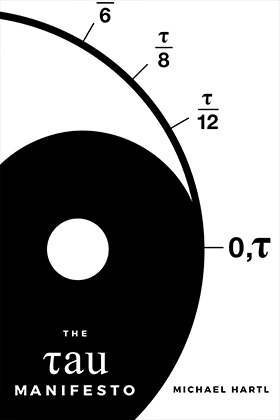 Explore the reasons why pi is wrong—that is, why pi is a confusing and unnatural choice for the circle constant—and meet its replacement, tau. Skeptics beware: by the end of the manifesto you may be surprised to find yourself converted to tauism. As founder of Tau Day and author of The Tau Manifesto, Michael Hartl is a leader in the international fight against π oppression. He is also the creator of the Ruby on Rails Tutorial, a book and screencast series that is one of the leading introductions to web development. Michael is a graduate of Harvard College, has a Ph.D. in Physics from Caltech, and is an alumnus of the Y Combinator entrepreneur program. Hooray for tau! This breathes new life into my trigonometry. That sound? It’s my mind blowing. Childhood suspicions confirmed. The circle constant is broken. Switching to τ immediately. Do not circles deserve first-class quadratic recognition? Let us throw off the yoke of ignorant π oppression! Oh no, I missed Tau Day! A purchase of The Tau Manifesto includes the full essay in all three common ebook formats (EPUB, MOBI, and PDF), as well as downloadable versions of the Tau Talk, both short (15 min.) and long (1 hr.) versions. Why would I want to buy The Tau Manifesto? All of the materials available are for purchase are also available online for free, but if you buy the manifesto then you own the files in perpetuity. You also get the satisfaction of lending your support to the cause. Finally, over the years I expect I will find various creative ways to support especially ardent tauists; no guarantees, but you can think of the product price as buying you admission to a very exclusive club. You will be emailed a link to download the book files.